CSIRO has teamed up with Melbourne medical implant company Anatomics and UK doctors to carry out world-first surgery to implant a 3D printed titanium and polymer- sternum into a British patient. Designed by Anatomics and printed at CSIRO’s Lab 22 facility in Melbourne, the sternum was implanted into 61-year-old Edward Evans, who had previously had his sternum removed due to a rare infection. Mr Evans has since made a successful recovery. It is the first time that a titanium sternum combined with a synthetic polymer have been used to replace bone, cartilage and tissue in a patient. The operation is the latest success story for the CSIRO-Anatomics partnership. 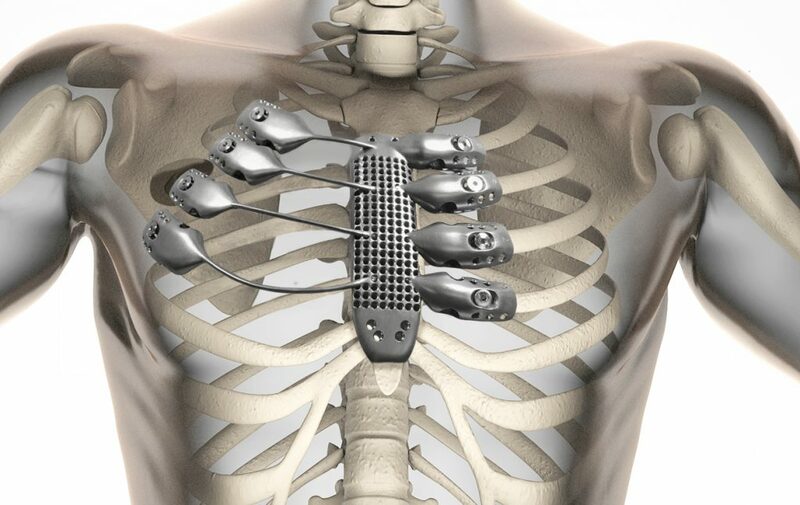 In 2015 a Spanish cancer patient was the recipient of a 3D printed titanium only sternum and rib implant that was designed and manufactured by CSIRO and Anatomics. That life-saving operation followed on from the production of a 3D printed titanium heel bone that prevented an Australian cancer patient from having his leg amputated in 2014. CSIRO’s Manufacturing business unit has led the collaboration with Anatomics. “I’m proud of our cutting edge work with Anatomics that has enabled patients around the world to regain the ability to walk, to sit-up and lead normal lives,” Director of CSIRO Manufacturing Dr Keith McLean said. Anatomics Executive Chairman Paul D’Urso said the successful recovery of Mr Evans was testament to Australian innovators and manufacturers being the best in the world. “For the first time, Anatomics, together with the CSIRO, has manufactured a 3D printed patient specific skeletal reconstruction with advanced composite materials,” Mr D’Urso said. Health Minister Greg Hunt welcomed the continual success of the Anatomics and the CSIRO collaboration, and said Australia’s world-leading expertise in health and medical research presented opportunities to build upon the innovative work being undertaken in the sector. “The Government is committed to working with the health and medical research and manufacturing community to support ways we can bring innovation to our current health framework, cut red-tape and grow Australia’s already considerable capability in this sector,” Minister Hunt said.